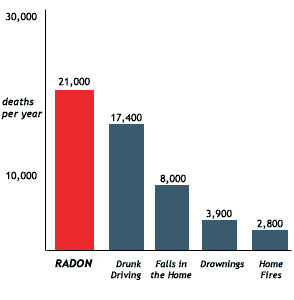 According to the Surgeon General of the United States, radon is the second leading cause of lung cancer within the USA. Radon is estimated to cause about 21,000 lung cancer deaths per year, according to EPA's 2003 Assessment of Risks from Radon in Homes (EPA 402-R-03-003). Only smoking causes more lung cancer deaths, but if your home has high radon levels and you smoke, then your risk of lung cancer is especially high. The Environmental Protection Agency (EPA) and the American Lung Association agree that long term exposure to elevated levels of radon pose a significant health risk to you and your family. Therefore, since radon is a colorless, odorless, and tasteless gas, the only way to determine if radon is in your home is by testing.